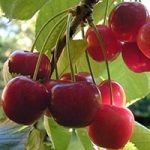 Colt rootstock produces sweet cherry trees 12-16 ft (4-5m) high / sour cherries 10-12 ft (3-3.5 m) high. Gisela rootstock is dwarfing, producing sweet cherries 8-10 ft (2.4-3 m) high / sour cherries 6-7 ft (1.8-2.1 m) high. Some varieties require cross pollination – see notes below.